Thalidomide has been shown to be an effective treatment in various immunologic diseases such as Crohn’s disease and rheumatoid arthritis. Its major effect is thought to be mediated by the inhibition of TNF-α, but the exact mechanism of action is still uncertain. Recent observations could demonstrate that the induction of monocyte apoptosis is a common feature of a variety of anti-inflammatory agents. Therefore, we investigated the role of thalidomide on monocyte apoptosis. Treatment with thalidomide resulted in apoptosis of human peripheral blood monocytes in a time- and dose-dependent manner as demonstrated by annexin V staining. Monocyte apoptosis required the activation of caspases, as combined stimulation by thalidomide together with the broad caspase inhibitor benzyloxycarbonyl-Val-Ala-Asp-fluoromethyl ketone markedly prevented monocyte cell death. Apoptosis was triggered by a CD95/CD95 ligand, TNF-RI, and TRAIL-R1 independent pathway with an inhibition of AKT-1 kinase and consecutive mitochondrial release of cytochrome c, followed by the proteolytic activation of initiator caspase-9 and effector caspase-3. Our data suggest that thalidomide-induced monocyte apoptosis is at least partially mediated by a mitochondrial signaling pathway and might contribute to the complex immunomodulatory properties of the drug. Thalidomide (α-N-phthalyl-glutamic-acid-imide) was first introduced in 1953 as an oral sedative hypnotic (1). After the drug was withdrawn from the market due to its teratogenicity, the surprising activity of thalidomide in reactive lepromatous leprosy stimulated further study (2). Thalidomide has recently been tried for many immunologic disorders, including rheumatoid arthritis (3), sarcoidosis (4), pyoderma gangraenosum (5), and chronic cutaneous lupus (6). In addition, case reports described dramatic benefit in Crohn’s disease (CD)4 (7, 8, 9) and three small open-label studies provide preliminary data suggesting beneficial effects of thalidomide in the treatment of patients with refractory CD, including fistulizing disease (10, 11, 12). The exact mechanisms of action of thalidomide still remain uncertain. Thalidomide is an agent with complex anti-angiogenic and immunomodulatory properties (13, 14). Recent studies suggest that thalidomide exerts its inhibitory action on TNF-α by enhancing degradation of TNF-α-mRNA (15). Thalidomide also inhibits monocyte IL-6 and IL-12 production (16, 17). Thalidomide does not only affect monocyte cytokine production but also influences the function of T cells by increasing IL-2-mediated T cell proliferation and IFN-γ production and costimulating preferentially the CD8-positive T cell subset (18). Furthermore, thalidomide inhibits neutrophil chemotaxis, modifies surface expression of adhesion molecules such as integrin receptors on leukocytes, and regulates dendritic cell function (19, 20, 21). Monocytes and macrophages belong to the main effector cells of the immune system as they play a central role in the initiation, development, and outcome of the immune response (22). They are known to be a major source of proinflammatory mediators such as TNF-α and IL-1β (23). Peripheral monocytes as well as differentiated tissue macrophages are known to play a key role in the inflammatory process of various immunomediated conditions such as inflammatory bowel disease (24), rheumatoid arthritis (25), or sepsis (26). Recently, we could demonstrate that glucocorticoids (GC) and the chimeric anti-TNF Ab infliximab trigger apoptosis in human peripheral blood monocytes involving different signaling pathways. Although GC-induced monocyte apoptosis involves CD95/CD95 ligand (CD95L) signaling, monocyte apoptosis induced by infliximab depends on the mitochondrial pathway (27, 28). Caspase activation via the mitochondrial pathway is mediated largely by cytochrome c, which is released into the cytosol, where it participates in the activation of initiator caspase-9. Subsequent activation of downstream members of the caspase family leads to apoptosis (29). In the present study, we demonstrate that thalidomide evokes apoptosis in human peripheral blood monocytes in a time- and dose-dependent manner. Treatment of monocytes with thalidomide does not induce the CD95/CD95L pathway, but inhibits AKT-1 kinase and increases the mitochondrial release of cytochrome c, followed by the proteolytic activation of caspase-9 and effector caspase-3. Thalidomide-induced apoptosis was markedly prevented by caspase inhibition. Our data suggest that the well-known anti-inflammatory and immunosuppressive effects of thalidomide on human monocytes and macrophages are at least partially mediated by the induction of apoptosis involving a cytochrome c-dependent pathway. Thalidomide was obtained as pure substance from Grünenthal (Aachen, Germany) and dissolved in DMSO (Sigma-Aldrich, St. Louis, MO) to give a stock solution of 10 mg/ml, which was kept at −20°C for up to 4 wk; further dilutions were made in culture medium immediately before use as indicated. PE-conjugated mouse anti-human Leu M3 mAb (anti-CD14, clone P9, IgG2b) and control mAbs of appropriate isotypes were obtained from BD Biosciences (Palo Alto, CA). FITC-labeled annexin V was purchased from Bender MedSystems (Vienna, Austria). The broad caspase inhibitor benzyloxycarbonyl-Val-Ala-Asp-fluoromethyl ketone (zVAD-fmk) was obtained from Promega (Mannheim, Germany). Anti-human CD95 mAb, neutralizing mouse anti-human TNF-RI Ab (IgG1) and neutralizing goat anti-human TRAIL-R1 Ab (IgG) were purchased from R&D Systems (Wiesbaden, Germany); anti-human CD95L (65322X, clone NOK-1, mouse IgG1), mouse anti-human cytochrome c mAb (MO37943), and polyclonal anti-mouse-biotin Ab were obtained from BD PharMingen (Heidelberg, Germany). Streptavidin-HRP was purchased from Amersham Pharmacia Biotech (Freiburg, Germany). Neutralizing anti-CD95L mAb (clone 5G51, mouse IgG1) was provided by BioCheck (Münster, Germany). Colorimetric caspase-3 and caspase-9 assays were obtained from R&D Systems. Abs to phosphorylated I-κBα and mitogen-activated protein (MAP) kinases (p44/42, stress-activated protein kinase/c-Jun N-terminal kinase (SAPK/JNK), p38) were obtained from Cell Signaling Technology (Beverly, MA). A Western blot analysis system was received from Amersham Pharmacia Biotech. All other reagents were obtained from Sigma-Aldrich. Human monocytes were isolated from 40 ml of EDTA-treated blood, drawn from fresh leukocyte buffy coats. We used a modification of the recently described isotonic density gradient centrifugation method with Ficoll (Biochrom, Berlin, Germany) and Percoll (Amersham, Uppsala, Sweden) (27). Briefly, mononuclear cells were collected from the interphase after Ficoll separation and washed twice in PBS. Subsequently, cells were separated into lymphocytes and monocytes on an isotonic Percoll density gradient (1.129 g/ml). From the two interphases, the upper interphase containing monocytes was collected and washed three times with PBS. The monocyte suspension was adjusted to 1 × 106 cells/ml and plated on 24-well plates (Greiner, Solingen, Germany). Monocytes were further enriched by 90 min of adherence to culture plates and washed twice in PBS. Enriched monocytes were incubated in RPMI 1640 medium supplemented with 3% heat-inactivated, pooled AB sera for 24–72 h in the presence or absence of thalidomide as indicated. All culture reagents had endotoxin levels of <0.01 ng/ml LPS; polymyxin B sulfate (Sigma-Aldrich) was added during the isolation and culturing process where indicated (1 μg/ml). Viability of the monocytes was >95% as determined by trypan blue exclusion, and purity was at least 90% as assessed by flow cytometric analysis and nonspecific esterase staining. Monocytes, prepared and treated as described above, were double labeled with PE-conjugated Leu M3 mAb (anti-CD14) and Annexin VFITC in PBS for 1 h at room temperature in the dark. PE-conjugated murine IgG mAbs of unrelated specificity were used as isotype controls. After staining, the cells were washed twice in PBS and measured by flow cytometry. Cytosolic cytochrome c was prepared as described elsewhere (30). In brief, after 36 h of incubation with thalidomide, adherent and floating cells were harvested and resuspended in 1 ml of extraction buffer containing 250 mM sucrose, 20 mM HEPES (pH 7.5), 10 mM KCl, 1.5 mM MgCl2, 1 mM EDTA, 1 mM DTT, and 10 μl of protease inhibitor set III (Calbiochem, La Jolla, CA). Cells were homogenized by repeated freezing and thawing, and centrifuged for 10 min at 1,000 × g to remove nuclei and unbroken cells. The supernatant was centrifuged at 13,000 × g for 20 min to pellet the mitochondria. The resulting supernatant (cytosolic fraction) was centrifuged at 100,000 × g for 1 h. Samples were diluted before electrophoresis to obtain a total protein concentration of 1 μg/μl. Thirty micrograms total protein of each sample was separated under reducing conditions on a 12.5% SDS-polyacrylamide gel. Protein transfer to Hybond-C nitrocellulose membranes (Amersham Pharmacia Biotech) was performed at 200 mA for 60 min using a Trans-Blot SemiDry Electrophoretic Transfer Cell (Bio-Rad, Hercules, CA). Membranes were blocked with 10% nonfat dry milk in TTBS buffer (0.01% Tween 20, 0.05 M Tris-HCl, 0.15 M NaCl, pH 7.5) for 120 min at room temperature and then incubated for 1 h with the primary Ab (mouse anti-human cytochrome c mAb; 2 μg/ml). Membranes were washed three times with TTBS and incubated with the secondary Ab (polyclonal anti-mouse-biotin Ab; 0.5 μg/ml) for 1 h, followed by an incubation with streptavidin-HRP for 30 min. After extensive washing, the reaction was developed by ECL (Amersham Pharmacia Biotech). Necrotic membrane damage was determined by trypan blue exclusion or by propidium iodide (PI) uptake into nonpermeabilized cells and subsequent flow cytometry using standard protocols. Monocytes were harvested from the culture plates by gentle pipetting on ice and labeled with anti-CD95 or anti-CD95L in FACS buffer (PBS containing 0.1% sodium azide and 10% FCS) for 1 h at 4°C. Cells were then washed in FACS buffer and stained with FITC-conjugated secondary Abs. After additional washings, cells were analyzed for CD95 and CD95L surface expression by flow cytometry. After 48 h of culture, monocytes were lysed in 100 μl of sample buffer containing 10 mM HEPES (pH 7.4), 220 mM mannitol, 68 mM sucrose, 2 mM NaCl, 2.5 mM KH2PO4, 0.5 mM EGTA, 2 mM MgCl2, 5 mM pyruvate, 1 mM PMSF, and 1 mM DTT. Total protein (100 μg) of each sample was then incubated with the colorimetric caspase-3 substrate Ac-DEVD-pNA. The release of the yellow chromophore p-nitroanilide was measured in a spectrophotometer at 405 nm. For caspase-9 assay, monocytes were lysed in the same manner. Total protein (100 μg) of each sample was then incubated with the colorimetric caspase-9 substrate LEHD-pNA. LEHD is the optimal cleavage recognition sequence for active human caspase-9. Again, the release of the chromophore p-nitroanilide was quantitated by spectrophotometry at a wavelength of 405 nm. The results are expressed as mean absorbance of stimulated and nonstimulated cells. The background controls (reactions where no cell lysate or where no colorimetric substrate was added) were subtracted from the experimental results before calculating the mean absorbance. To measure AKT kinase activity, a nonradioactive kinase assay was used as recommended by the manufacturer (AKT Kinase Assay kit; Cell Signaling Technology). In brief, thalidomide-treated monocytes or Th precursor (THP)-1 cells were washed and lysed in 1× cell lysis buffer containing 20 mM Tris (pH 7.5), 150 mM NaCl, 1 mM EDTA, 1 mM EGTA, 1% Triton X-100, 2.5 mM sodium pyrophosphate, 1 mM β-glycerolphosphate, 1 mM Na3VO4, 1 μg/ml leupeptin, and 1 mM PMSF. Two hundred microliters of cell lysate were immunoprecipitated overnight with 20 μl of immobilized AKT Ab, centrifuged at 14,000 × g, washed, and resuspended in 50 μl 1× kinase buffer (25 mM Tris (pH 7.5), 5 mM β-glycerolphosphate, 2 mM DTT, 0.1 mM Na3VO4, 10 mM MgCl2). The reaction was started by adding 1 μl of 10 mM ATP and 1 μg of glycogen synthase kinase (GSK)-3 fusion protein. After 30 min incubation at 30°C, the reaction was terminated by adding 25 μl of 3× SDS sampling buffer. 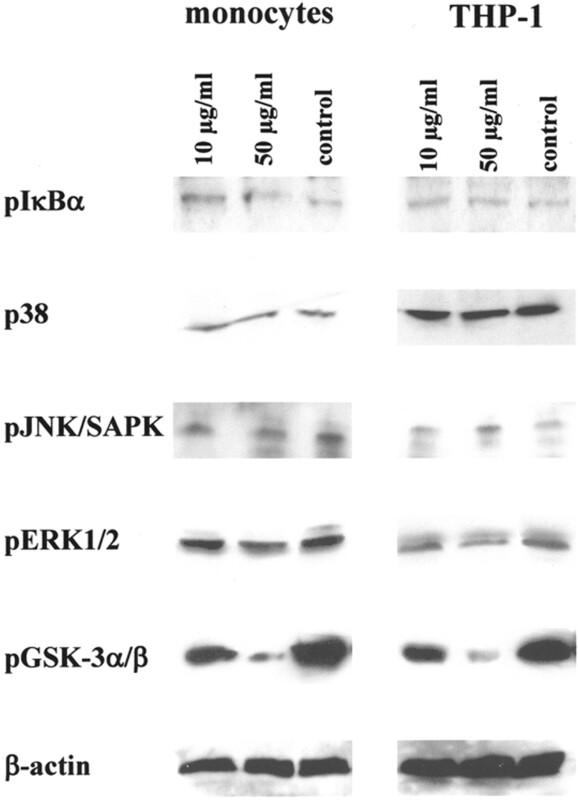 Phosphorylated GSK protein was detected by Western blotting using an anti-phospho-GSK-3α and -3β (Ser21/9) Ab. Results are given as means ± SD. For statistical analysis Student’s unpaired t test was used. Statistical significance was considered if p < 0.05. All experiments were performed at least 10 times with different blood donors, unless otherwise indicated. Monocytes were seeded into 24-well plates at a density of 1 × 106 cells/ml and cultured for 24, 48, and 72 h in RPMI 1640 medium supplemented with 3% AB serum and different concentrations of thalidomide. By using flow analysis we determined whether thalidomide treatment of monocytes at concentrations of 2, 10, and 50 μg/ml affects the number of annexin V-positive cells. Although only a small part of the monocytes revealed spontaneous apoptosis after 48 h in medium control (including DMSO), the percentage of apoptotic cells (CD14−annexin V+ cells) increased up to 23.2 ± 6.9% and 48.7 ± 8.6% in monocyte culture with 10 μg/ml and 50 μg/ml thalidomide, respectively (Fig. 1⇓). By analyzing the time course of thalidomide-induced monocyte cell death over 72 h, we also could demonstrate a time-dependent increase of annexin V-positive monocytes (Fig. 2⇓). However, the addition of polymyxin B to monocyte cultures did not alter the proapoptotic effect of thalidomide (data not shown). Thalidomide induces monocyte apoptosis. 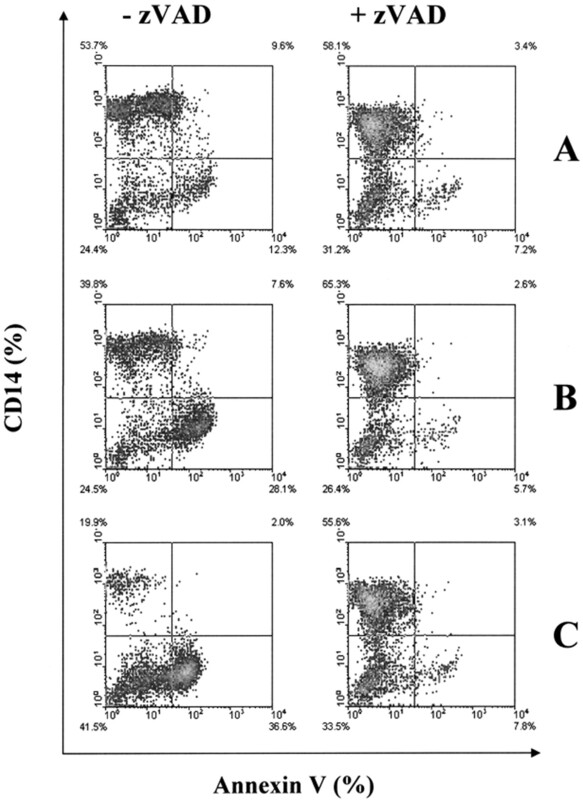 Monocytes were cultured in medium alone (plus DMSO, A) or were incubated with different concentrations of thalidomide (B, 2 μg/ml; C, 10 μg/ml∗; D, 50 μg/ml∗∗) for 72 h and analyzed for CD14 expression and annexin V positivity by flow cytometry. Compared with medium control, thalidomide enhanced the annexin V binding, followed by down-regulation of CD14 expression in a dose-dependent manner. Representative data of 10 independent experiments are shown. ∗, p < 0.05; ∗∗, p < 0.01 compared with DMSO-treated controls. Time course of thalidomide-induced monocyte apoptosis over 72 h. Monocytes were stimulated with thalidomide (50 μg/ml) for 24∗, 48∗∗, and 72∗∗ h. The presented data reveal that the observed apoptotic alterations occur in a time-dependent fashion. Representative data of three independent experiments are shown. ∗, p < 0.05; ∗∗, p < 0.01 compared with DMSO-treated controls. To distinguish apoptotic from necrotic cell death we performed double staining with Annexin VFITC and the DNA dye PI. Monocyte treatment with different doses of thalidomide resulted in increased annexin V staining, but no membrane damage occurred as demonstrated by PI exclusion (data not shown). In summary, these data suggest that thalidomide induces apoptotic, but not necrotic, cell death in human monocytes. Monocytes are known to express both CD95 and CD95L on their cell surface (31). Recently, we could demonstrate that GC- and IL-10-triggered monocyte apoptosis depends on the involvement of the CD95/CD95L system (27, 32). To analyze the relevance of this signaling pathway for thalidomide-induced monocyte apoptosis, monocyte expression of CD95 and CD95L was examined by FACS analysis. 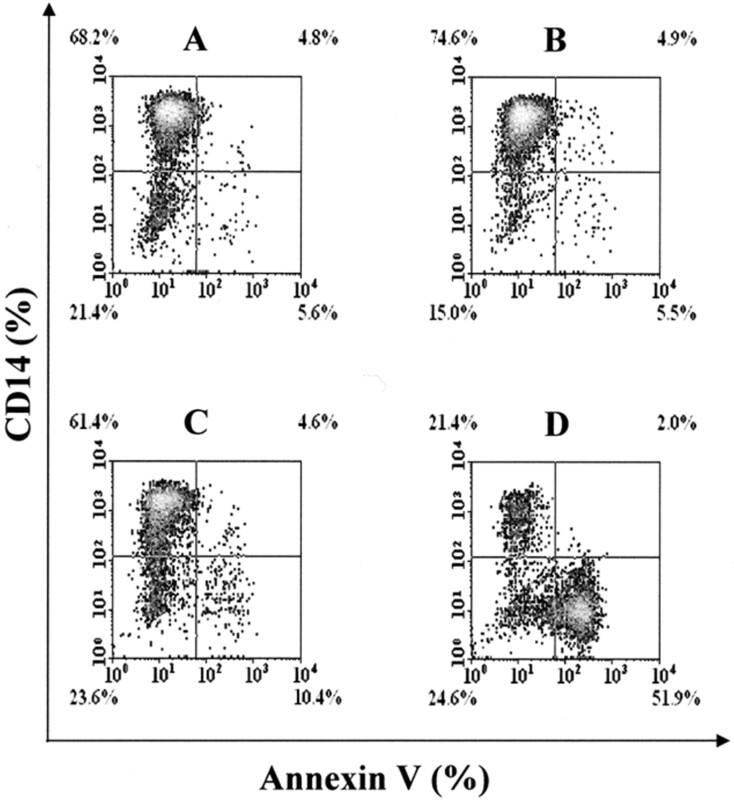 Treatment of peripheral blood monocytes with different concentrations of thalidomide as indicated above did not significantly alter the expression of CD95 and CD95L, whereas GC at a concentration of 10−6 M dexamethasone led to a significant increase of the surface expression of CD95 and CD95L (Fig. 3⇓A). In addition, blocking of Fas/Fas ligand interaction by preincubation with a neutralizing anti-CD95L Ab did not diminish thalidomide-induced monocyte apoptosis as determined by annexin V staining. In the same way, blocking of other members of this family such as TNF-RI and TRAIL-R1 with neutralizing Abs did not prevent thalidomide-induced monocyte apoptosis regardless if cells were treated simultaneously with thalidomide and one of the neutralizing Abs (Fig. 3⇓B) or whether they initially were preincubated for 24 h and then stimulated with thalidomide for another 48 h (data not shown). Therefore, it is not likely that CD95 ligation, TNF-R, and TRAIL play a role in thalidomide-induced cell death of monocytes. Thalidomide-induced mono-cyte apoptosis is not receptor-mediated. A, Monocytes were cultured for 48 h with medium alone (I), dexamethasone (II, 10−6 M), and different concentrations of thalidomide (III, 2 μg/ml; IV, 10 μg/ml; V, 50 μg/ml). As determined by flow cytometry, the mean fluorescence of CD95 and CD95L surface expression was not enhanced by thalidomide in comparison to medium alone (p > 0.1, not significant). In contrast, treatment with dexamethasone that served as positive control induced an up-regulation of CD95 and CD95L (p < 0.01 compared with untreated controls). B, In parallel, inhibition of receptor-mediated effects by coincubation with inhibiting Abs to CD95L, TNF-RI, and TRAIL-RI did not alter the proapoptotic effect of thalidomide (10 μg/ml). Data are representative for four independent experiments. As apoptosis is usually associated with activation of the caspase cascade, we further investigated whether inhibition of caspase activity could abolish thalidomide-triggered apoptosis of human monocytes. Therefore, the broad caspase inhibitor zVAD-fmk was added to thalidomide-treated monocytes. After 48 h the amount of annexin V-positive cells was analyzed by flow cytometry and compared with positive control cells. Indeed, the observed apoptotic effect of thalidomide on monocytes was almost completely abolished by additional incubation with zVAD-fmk (Fig. 4⇓). Thalidomide-induced monocyte cell death is caspase dependent. Stimulation of human monocytes with medium alone (A) and two different concentrations of thalidomide (B, 10 μg/ml; C, 50 μg/ml) in comparison to combined treatment by thalidomide together with the broad caspase inhibitor zVAD-fmk for 72 h. The proapoptotic effect of thalidomide on monocytes was almost completely abolished by zVAD-fmk (50 μM) as determined by flow cytometry. There is ample evidence that caspase-3 is a key effector caspase that degrades several cellular proteins in various forms of apoptosis. Using a colorimetric assay, we determined whether incubation of monocytes with increasing concentrations of thalidomide (2, 10, and 50 μg/ml) for 48 h could induce caspase-3 activity. Thalidomide treatment significantly increased the proteolytic activity of effector caspase-3 in a dose-dependent manner compared with medium control. 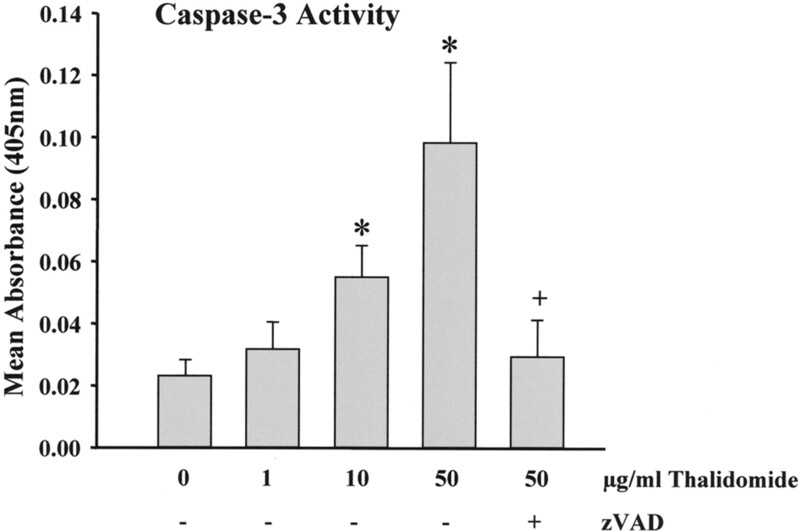 The increase in caspase-3 activity was markedly prevented after combined treatment by thalidomide together with the broad caspase inhibitor zVAD-fmk (Fig. 5⇓).
. Thalidomide induces caspase-3 activation. Human monocytes were treated with indicated concentrations of thalidomide for 48 h. Total protein (100 μg) of each sample was then incubated with the colorimetric caspase-3 substrate Ac-DEVD-pNA. Thalidomide-stimulated monocytes revealed a dose-dependent activation of caspase-3, which was almost completely inhibited by cotreatment with zVAD-fmk (50 μM). Data represent means ± SD from five independent experiments (∗, p < 0.001 compared with control cells; +, p < 0.001 compared with thalidomide (50 μg/ml)-treated monocytes). As there was no evidence for involvement of CD95/CD95L, TNF-R, and TRAIL in thalidomide-induced monocyte apoptosis, we examined another important apoptotic signaling pathway that is associated with the release of cytochrome c from mitochondria into the cytosol. By performing immunoblot analysis, we could determine a dose-dependent increase of cytochrome c after incubation of monocytes with thalidomide for 48 h (Fig. 6⇓). As cytochrome c release usually induces the activation of caspase-9 (29), we further determined caspase-9 activation in human monocytes after treatment with different concentrations of thalidomide for 48 h by using a colorimetric assay. As shown in Fig. 7⇓, treatment of monocytes with thalidomide strongly increased the proteolytic activity of caspase-9 in a dose-dependent manner in comparison to medium control (plus DMSO). Involvement of cytochrome c in thalidomide-induced monocyte apoptosis. Monocytes were incubated with three different concentrations of thalidomide (A, 5 μg/ml; B, 10 μg/ml; C, 50 μg/ml thalidomide) and medium alone (D, control) and cultured for 36 h. Cytochrome c release after treatment with thalidomide was determined by immunoblot analysis showing specific bands for cytochrome c.
Treatment with thalidomide strongly induces the proteolytic activity of initiator caspase-9 in human monocytes. 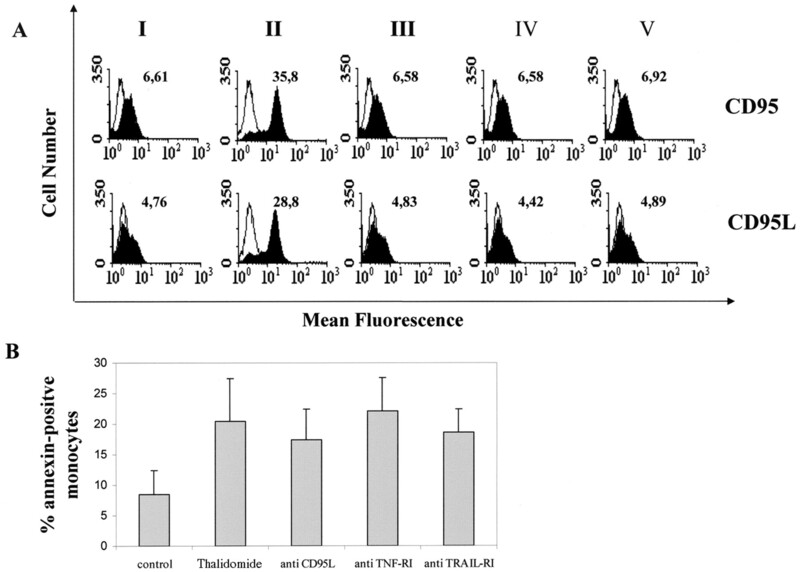 Monocytes were stimulated with different concentrations of thalidomide as indicated for 48 h. Total protein (100 μg) of each sample was then incubated with the colorimetric caspase-9 substrate LEHD-pNA. 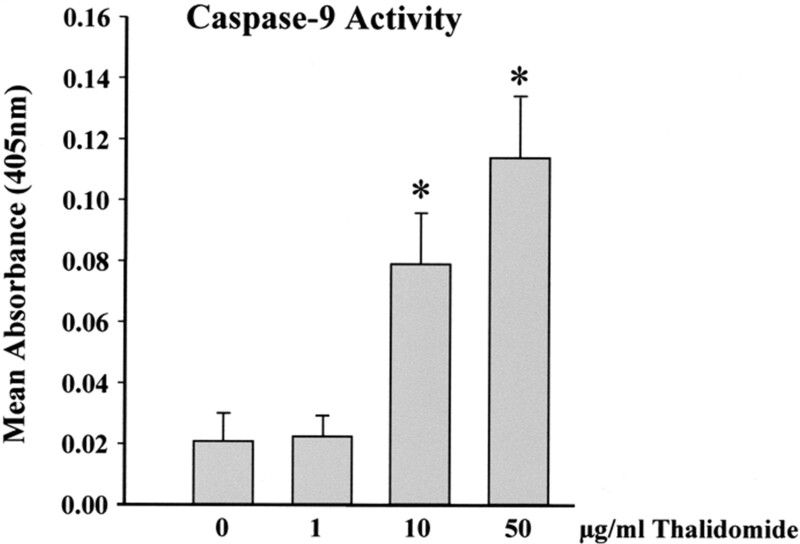 Thalidomide-stimulated monocytes revealed activation of caspase-9 in a dose-dependent manner. Data represent means ± SD from five independent experiments (∗, p < 0.01 compared with control cells). To further elucidate the underlying mechanisms involved in thalidomide-induced monocyte apoptosis we studied the activation of differential signal transduction pathways after thalidomide incubation in primary monocytes and THP-1 cells. Western blot analysis of phosphorylated I-κBα could not show any activation of NF-κB in primary monocytes as well as in THP-1 cells after incubation with various concentrations of thalidomide (Fig. 8⇓). In contrast, we were able to detect a significant and concentration-dependent inactivation of AKT-1 in both cell systems tested. Additional characterization of MAP kinase activation was able to detect a limited inactivation of extracellular signal-regulated kinase (ERK)-1/2, whereas p38α as well as SAPK/JNK were not affected. The data suggest that thalidomide induces a receptor-independent apoptosis of monocytes by inactivation of the PI3K-AKT-1 signaling pathway and consecutive release of mitochondrial cytochrome c.
Thalidomide induces monocyte apoptosis by inactivation of AKT-1. Freshly isolated monocytes and THP-1 cells were incubated with 10 and 50 μg/ml thalidomide and total cellular protein was extracted after 72 h. Western blot analysis of phosphorylated I-κBα, SAPK/JNK, p38α, and ERK1/2 revealed a limited inactivation of ERK1/2 after thalidomide incubation, whereas other MAP kinases were not affected. To determine AKT-1 activity, equal amounts of total cellular protein were immunoprecipitated with an immobilizing AKT-1 Ab. Kinase activity was detected by a GSK-3 fusion protein kinase assay and phosphorylated GSK-3α and -3β detected by Western blotting. The data show a significant inactivation of PI3K-AKT-1 activity by thalidomide in a concentration-dependent manner in both cell systems tested. Loading controls were done by Western blot analysis of β-actin. An unanticipated sequence of events has rekindled interest in the therapeutic use of thalidomide. Thalidomide is a putative anti-angiogenic and immunomodulatory agent that is effective in several malignancies and various dermatologic and rheumatologic conditions in addition to CD (3, 4, 5, 6, 10, 11, 12). Thalidomide exhibits immunomodulatory effects on different immune and inflammatory cells including monocytes. As a major mechanism of action the inhibition of TNF-α production by stimulated monocytes has been described (14, 15). We recently showed that different anti-inflammatory therapeutics, including the chimeric anti-TNF Ab infliximab, induce apoptosis in human monocytes (28). Therefore, the induction of apoptosis in monocytes seems to be an important anti-inflammatory process, and knowledge of its underlying mechanisms is of great importance. In the present study, we investigated the effect of thalidomide—another agent with anti-TNF-α properties—on monocyte apoptosis that might give further insights into its immunomodulatory mechanisms. We could provide evidence that thalidomide induces apoptosis in peripheral blood monocytes in a time- and dose-dependent manner. The best effects could be achieved with a concentration of 10–50 μg/ml thalidomide, which is the usually applied dose of thalidomide in in vitro studies (14, 15, 16, 17, 18, 19, 20). Previously, two major apoptotic pathways have been described. One is dependent on the release of proapoptotic proteins from mitochondria into the cytosol (29), while the second major pathway involves caspase activation via membrane receptors including the CD95/CD95L system and members of the TNF family of cell death receptors (33). As apoptosis of human monocytes induced by IL-10 or GC is mediated by CD95 ligation (27, 32), we determined the possible involvement of this system in thalidomide-induced monocyte apoptosis. However, there was no increase in monocyte expression of CD95 and CD95L after treatment with thalidomide, and blocking of CD95 ligation by a neutralizing Ab against CD95L did not diminish thalidomide-induced apoptosis of human monocytes. In the same way, blocking of TNF-RI and TRAIL-R1 with neutralizing Abs did not lead to a reduction of thalidomide-triggered monocyte apoptosis. As the aforesaid membrane receptors did not seem to play a role in thalidomide-induced monocyte cell death, we determined whether thalidomide-induced cell death involves mitochondrial signaling. Permeability of the mitochondrial membrane is essential to initiation of apoptosis through this pathway that is mediated largely by cytochrome c. In response to a wide variety of apoptotic stimuli, cytochrome c is released from the mitochondria into the cytosol, where it binds the caspase activator, apoptotic protease activating factor-1, producing a conformational change that allows it to bind and activate initiator caspase-9 (29). In this study, we were able to prove mitochondrial release of cytochrome c after treatment with thalidomide by immunoblotting and, in addition, proteolytic activation of caspase-9 and caspase-3, which triggers features of apoptosis such as DNA fragmentation and exposure of phosphatidylserine to the outer membrane leaflet (34). Two major pathways mediating mitochondria-mediated apoptosis have been described in differentiated monocytes (35). Inhibition of constitutively activated NF-κB rapidly results in the suppression of A1, which leads to a loss of mitochondrial integrity followed by cytochrome c release and rapid cell death. The second pathway includes the inhibition of the AKT-1. Inhibition of this pathway results in the suppression of myeloid-cell leukemia 1, which also decreases mitochondrial integrity and thereby induces cell death. This process is independent of death receptors and does not influence NF-κB activity (36). In our study, we were indeed able to show a significant influence of thalidomide on AKT-1 activity suggesting that monocyte apoptosis is mediated by this pathway as death receptors, NF-κB activity, and MAP kinases were not involved. The limited inactivation of p44 MAP kinase in our study might be related to PI3K-AKT-1 inhibition as observed earlier (37). Recently, Marriott and colleagues (38) described a subclass of second-generation thalidomide analogues, selective cytokine inhibitory drug 3, that exhibit anti-solid tumor activity in a variety of different tumor cell lines and in a tumor xenograft model by inducing apoptosis in a B cell leukemia-2-dependent manner. Interestingly, this process did not involve p53, known to be a key cellular regulator mutated in multiple clinical relevant tumors. Therefore, it seems likely that proapoptotic effects mediated by thalidomide might represent a good therapeutic tool in neoplastic diseases. In parallel, apoptosis has also been shown to be effective in the therapy of chronic inflammatory diseases (35). In this context, different therapeutics of rheumatoid arthritis or IBD, such as methotrexate, sulfasalazine, and steroids, as well as infliximab, have been shown to induce apoptosis in a variety of effector cells, thereby reducing inflammatory activity. However, as anti-apoptotic mechanisms are also effective (e.g., FLIP, x-linked inhibitor of apoptosis protein, B cell line-2) it seems conceivable that targeting different apoptotic effector mechanisms (CD95, NF-κB, AKT, p53) could prove to be beneficial. As monocytes present main effector cells in the initiation, development, and outcome of the immune response (22), apoptosis induced in this cell population might explain important anti-inflammatory activities of thalidomide in vitro and in vivo. Reported down-regulation of a variety of monocyte-derived inflammatory mediators such as TNF-α, IL-6, and IL-12 after treatment with thalidomide (14, 15, 16, 17) may at least in part be a consequence of thalidomide-induced monocyte apoptosis. Although the present data clearly demonstrate that thalidomide induces apoptosis by a cytochrome c- and caspase-dependent pathway, our results do not exclude additional mechanisms of thalidomide action. As TNF-α exerts anti-apoptotic effects on human monocytes (39), inhibition of this mediator by thalidomide might exert proapoptotic effects. It has also been shown that thalidomide is capable of suppressing TNF-induced NF-κB activation, which therefore may also play a role in monocyte apoptosis evoked by thalidomide (40). A serious disadvantage of treatment with thalidomide is given by the well-known side effects, especially teratogenicity, peripheral neuropathy, and sedation that is commonly observed (41). Thalidomide analogues designed for increased efficacy and decreased toxicity, for example, lack of teratogenicity and decreased sedation are currently entering clinical trials in various diseases including CD. Some of these analogues inhibit TNF-α production in human monocytes with a 10,000-fold increased potency compared with the parent compound and resemble thalidomide in their ability to influence other cytokines and immune cells (42). Enrollment in clinical trials as well as knowledge of the underlying biologic mechanisms are therefore paramount to further define the role of thalidomide and its analogues in the treatment of chronic inflammatory diseases. In summary, our findings suggest that thalidomide induces monocyte apoptosis involving a cytochrome c-dependent pathway, thereby activating initiator caspase-9 and effector caspase-3, promoting the manifestation of some of the more classical features of apoptosis. At least in part, this may explain the reported down-regulation of a variety of monocyte-derived inflammatory mediators and the immunomodulatory properties observed for thalidomide that contribute to its beneficial effects in various immunologic disorders. We thank E. Weber and S. Jansen for technical assistance. ↵1 This work was supported by the Wilhelm Sander-Stiftung (München, Germany) through Grant 96.046.3 (to T.K.) and by the Interdisciplinary Center for Clinical Research, IZKF-D13. ↵2 H.R.G. and A.L. contributed equally to this paper. ↵4 Abbreviations used in this paper: CD, Crohn’s disease; CD95L, CD95 ligand; ERK, extracellular signal-regulated kinase; GC, glucocorticoid; JNK, c-Jun N-terminal kinase; MAP, mitogen-activated protein; PI, propidium iodide; PI3K, phosphatidylinositol 3-kinase; SAPK, stress-activated protein kinase; THP, Th precursor; zVAD-fmk, benzyloxycarbonyl-Val-Ala-Asp-fluoromethyl ketone; GSK, glycogen synthase kinase. Kanbayashi, T., T. Shimizu, Y. Takahashi, T. Kitajima, K. Takahashi, Y. Saito, Y. Hishikawa. 1999. Thalidomide increases both REM and stage 3–4 sleep in human adults: a preliminary study. Sleep 22:113. Sheskin, J.. 1965. Thalidomide in the treatment of lepra reaction. Clin. Pharmacol. Ther. 6:303. Gutierrez-Rodriguez, O., P. Starusta-Bacal, O. Gutierrez-Montes. 1989. Treatment of refractory rheumatoid arthritis: the thalidomide experience. J. Rheumatol. 16:158. Carlesimo, M., S. Giustini, A. Rossi, P. Bonaccorsi, S. Calvieri. 1995. Treatment of cutaneous and pulmonary sarcoidosis with thalidomide. J. Am. Acad. Dermatol. 32:866. Hecker, M. S., M. G. Lebwohl. 1998. Recalcitrant pyoderma gangrenosum: treatment with thalidomide. J. Am. Acad. Dermatol. 38:490. Holm, A. L., K. E. Bowers, T. O. McMeekin, A. Gaspari. 1993. Chronic cutaneous lupus erythematosus treated with thalidomide. Arch. Dermatol. 129:1548. Fishman, S. J., N. R. Feins, R. J. D’Amato, J. Folkman. 2000. Thalidomide therapy for Crohn’s disease. Gastroenterology 119:596. Odeka, E. B., V. Miller. 1997. Thalidomide in oral Crohn’s disease refractory to conventional medical treatment. J. Pediatr. Gastroenterol. Nutr. 25:250. Wettstein, A. R., A. P. Meagher. 1997. Thalidomide in Crohn’s disease. Lancet 350:1445. Vasiliauskas, E. A., L. Y. Kam, M. T. Abreu-Martin, P. V. Hassard, K. A. Papadakis, H. Yang, J. B. Zeldis, S. R. Targan. 1999. An open-label pilot study of low-dose thalidomide in chronically active, steroid-dependent Crohn’s disease. Gastroenterology 117:1278. Ehrenpreis, E. D., S. V. Kane, L. B. Cohen, R. D. Cohen, S. B. Hanauer. 1999. Thalidomide therapy for patients with refractory Crohn’s disease: an open-label trial. Gastroenterology 117:1271. Bauditz, J., S. Wedel, H. Lochs. 2002. Thalidomide reduces tumour necrosis factor α and interleukin 12 production in patients with chronic active Crohn’s disease. Gut 50:196. D’Amato, R. J., M. S. Loughnan, E. Flynn, J. Folkman. 1994. Thalidomide is an inhibitor of angiogenesis. Proc. Natl. Acad. Sci. USA 91:4082. Sampaio, E. P., E. N. Sarno, R. Galilly, Z. A. Cohn, G. Kaplan. 1991. Thalidomide selectively inhibits tumor necrosis factor α production by stimulated human monocytes. J. Exp. Med. 173:699. Moreira, A. L., E. P. Sampaio, A. Zmuidzinas, P. Frindt, K. A. Smith, G. Kaplan. 1993. Thalidomide exerts its inhibitory action on tumor necrosis factor by enhancing mRNA degradation. J. Exp. Med. 177:1675. Moller, D. R., M. Wysocka, B. M. Greenlee, X. Ma, L. Wahl, D. A. Flockhart, C. L. Karp. 1997. Inhibition of IL-12 production by thalidomide. J. Immunol. 159:5157. Rowland, T. L., S. M. McHugh, J. Deighton, R. J. Dearman, P. W. Ewan, I. Kimber. 1998. Differential regulation by thalidomide and dexamethasone of cytokine expression in human peripheral blood mononuclear cells. Immunopharmacology 40:11. Haslett, P. A., L. G. Corral, M. Albert, G. Kaplan. 1998. Thalidomide costimulates primary human T lymphocytes, preferentially inducing proliferation, cytokine production, and cytotoxic responses in the CD8+ subset. J. Exp. Med. 187:1885. Geitz, H., S. Handt, K. Zwingenberger. 1996. Thalidomide selectively modulates the density of cell surface molecules involved in the adhesion cascade. Immunopharmacology 31:213. Dunzendorfer, S., P. Schratzberger, N. Reinisch, C. M. Kahler, C. J. Wiedermann. 1997. Effects of thalidomide on neutrophil respiratory burst, chemotaxis and transmigration of cytokine- and endotoxin-activated endothelium. Naunyn Schmiedeberg’s Arch. Pharmacol. 356:529. Mohty, M., A. M. Stoppa, D. Blaise, D. Isnardon, J. A. Gastaut, D. Olive, B. Gaugler. 2002. Differential regulation of dendritic cell function by the immunomodulatory drug thalidomide. J. Leukocyte Biol. 72:939. Solbach, W., H. Moll, M. Rollinghoff. 1991. Lymphocytes play the music but the macrophage calls the tune. Immunol. Today. 12:4. Munoz, C., J. Carlet, C. Fitting, B. Misset, J. P. Bleriot, J. M. Cavaillon. 1991. Dysregulation of in vitro cytokine production by monocytes during sepsis. J. Clin. Invest. 88:1747. Yao, K., A. Iwashita, T. Yao, S. Takemura, K. Furukawa, T. Matsui, K. Aoyagi. 1996. Increased numbers of macrophages in noninflamed gastroduodenal mucosa of patients with Crohn’s disease. Dig. Dis. Sci. 11:2260. Hart, P. H., M. J. Ahern, M. D. Smith, J. J. Finlay-Jones. 1995. Comparison of the suppressive effects of interleukin-10 and interleukin-4 on synovial fluid macrophages and blood monocytes from patients with inflammatory arthritis. Immunology 84:536. Hensler, T., C. D. Heidecke, H. Hecker, K. Heeg, H. Bartels, N. Zantl, H. Wagner, J. R. Siewert, B. Holzmann. 1998. Increased susceptibility to postoperative sepsis in patients with impaired monocyte IL-12 production. J. Immunol. 161:2655. Schmidt, M., N. Lügering, A. Lügering, H.-G. Pauels, K. Schulze-Osthoff, W. Domschke, T. Kucharzik. 2001. Role of CD95/CD95L in glucocorticoid induced monocyte apoptosis. J. Immunol. 66:1344. Lügering, A., M. Schmidt, N. Lügering, H.-G. Pauels, W. Domschke, T. Kucharzik. 2001. Infliximab induces apoptosis in monocytes from patients with chronic active Crohn’s disease by using a caspase-dependent pathway. Gastroenterology 121:1145. Green, D. R., J. C. Reed. 1998. Mitochondria and apoptosis. Science 281:1309. Li, S., T. Takasu, D. M. Perlman, M. S. Peterson, D. Burrichter, S. Avdulov, P. B. Bitterman, V. A. Polunosky. 2003. Translation factor eIF4E rescues cells from myc-dependent apoptosis by inhibiting cytochrome c. J. Biol. Chem. 278:3015. Kiener, P. A., P. M. Davis, G. C. Starling, C. Mehlin, S. J. Klebanoff, J. A. Ledbetter, W. C. Liles. 1997. Differential induction of apoptosis by Fas-Fas ligand interactions in human monocytes and macrophages. J. Exp. Med. 185:1511. Schmidt, M., N. Lügering, H.-G. Pauels, K. Schulze-Osthoff, W. Domschke, T. Kucharzik. 2000. IL-10 induces apoptosis in monocytes involving the CD95/CD95L pathway. Eur. J. Immunol. 30:1769. Ashkenazi, A., V. Dixit. 1998. Death receptors: signaling and modulation. Science 281:1305. Jänicke, R. U., M. L. Sprengart, M. R. Wati, A. G. Porter. 1998. Caspase-3 is required for DNA fragmentation and morphological changes associated with apoptosis. J. Biol. Chem. 273:9357. Pope, R. M.. 2002. Apoptosis as a therapeutic tool in rheumatoid arthritis. Nat. Rev. Immunol. 2:527. Liu, H., H. Perlman, L. J. Pagliari, R. M. Pope. 2001. Constitutively activated Akt-1 is vital for the survival of human monocyte-differentiated macrophages: role of Mcl-1, independent of nuclear factor (NF)-κB, Bad, or caspase activation. J. Exp. Med. 194:113. Martin, M., R. E. Schifferle, N. Cuesta, S. N. Vogel, J. Katz, S. M. Michalek. 2003. Role of the phosphatidylinositol 3 kinase-Akt pathway in the regulation of IL-10 and IL-12 by Porphyromonas gingivalis lipopolysaccharide. J. Immunol. 171:717. Marriott, J. B., I. A. Clarke, A. Czajka, K. Dredge, K. Childs, H.-W. Man, P. Schafer, S. Gowinda, G. W. Muller, D. I. Stirling, A. G. Dalgleish. 2003. A novel subclass of thalidomide subclass analogue with anti-solid tumor activity in which caspase-dependent apoptosis is associated with altered expression of bcl-2 family proteins. Cancer Res. 63:593. Mangan, D. F., G. R. Welch, S. M. Wahl. 1991. Lipopolysaccharide, tumor necrosis factor-α, and IL-1β prevent programmed cell death (apoptosis) in human peripheral blood monocytes. J. Immunol. 146:1541. Majumdar, S., B. Lamothe, B. B. Aggarwal. 2002. Thalidomide suppresses NF-κB activation induced by TNF and H2O2, but not that activated by ceramide, lipopolysaccharides, or phorbol ester. J. Immunol. 168:2644. Stirling, D. I.. 2000. Pharmacology of thalidomide. Semin. Hematol. 37:5. Corral, L. G., G. Kaplan. 1999. Immunomodulation by thalidomide and thalidomide analogues. Ann. Rheum. Dis. 558:107.